We have now expanded our Specimen Mount section due to the increased demand for us to offer more of a variety. To make your SEM work easier and save you a great deal of time searching for the right mount, we now offer you a complete line of specimen mounts. * Aluminum Mounts – Made from ultra-pure aluminum. The more popular mounts are available in two grades of finish: standard and polished (luster). - Standard finish: lathe finish; economically priced. - Polished finish: A cloth polished finish which produces a smooth and luster surface. * Minimum order 500/pk. Designate number sequence when ordering. Same as above – Shorter pin version. Comes either plain or with 9 divisions. Comes plain or with 3 divisions. These angled mounts feature an orientation cross for precise positioning towards the EDS detector. A 22° or 25° tilt provides better detection and higher signal-to-noise ratio for x-ray analysis. Made from Aluminum. These mounts work with the Hitachi line of scopes listed above. They are made from aluminum. Available in four sizes. ½"dia. (12.7mm) with ⅛" (3.1mm) pin. These mounts and sample holders make it easy to clamp and position cross sectional samples for AFM imaging. They're easy to attach to the magnetic sample holder of the AFM system. Compatible with most AFM systems on the market. These pins are fully compatible with the Gatan 3View systems; 2 mm pin, 3 mm head with cone top and total height of 12.5 mm. Manufactured from vacuum grade aluminium. When you need a special Gatan 3View sample stub, which is not offered on our website, please contact us. We can manufacture custom sample stubs or might be able to suggest a solution with alternative sample stubs. Please see Storage Box for Gatan 3View® Pin Stubs here. The Gatan 3View stub handling Tweezers are especially designed for handling the 2 mm thin pin of the 3View system stubs used in the Gatan 3View system. They are designed as side grippers for easy grabbing and holding of the 2 mm pin to facilitate handling and storing the 3View stubs. Length: 118 mm. Custom tweezers specifically made to fit the Cryoplunge™ an instrument used in the preparation of frozen hydrated specimens for cryoEM. This mount is made from a special certified Aluminum alloy which does not contain any of the objectionable elements that may interfere with samples collected for GSR. 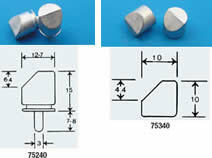 These mounts are 12.7mm x 11mm. These kits are suitable for field work and gunshot residue in the lab or out. Manufactured from a special – certified aluminum alloy, containing only trace amounts of Barium (~0.00010%), Copper (~0.0139%), Zinc (~0.0094%), Nickel (~0.00309%), and Antimony (~0.00080%). 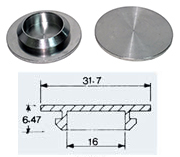 These sample mounts are suitable for typical forensic sample studies. The kit consists of 10 pin mounts (12.74mm diameter) 10 carbon adhesive tabs, 10 storage vials, and one plastic tweezer. Two styles of glass vials are available as well as one in plastic. The material is extremely anisotropic, meaning it conducts heat and electricity in the a-b plane like copper but acts like a ceramic in the normal direction. In an annealed state, the thermal and conduction properties increase up to four to eight times that of aluminum and copper respectively. The material has zero porosity making it extremely stable and exhibits no outgassing. It is ideal for use in corrosive environments including acids and chlorine, and is highly transparent to organic samples and electrons, for analytical work, such as x-ray investigation, metallurgical, crystal growth, medical imaging technology, etc. For use with the Atomic Force Microscope. 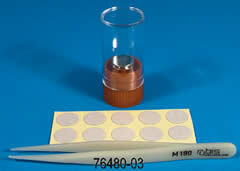 These are high quality metal discs with smooth edges and flat surfaces for use in Atomic force Microscopy. 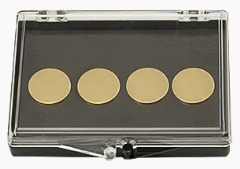 These metal specimen discs are high quality – made of magnetic stainless steel coated with 1µm gold. They have smooth edges and consistently flat surfaces to ensure secure holding. Specimens can be mounted directly on the metal discs with double sided tape, epoxy or conductive paste. If a mica specimen support is needed, the mica discs can be easily mounted on the metal support discs. These discs offer excellent resistance to electromigration, high electrical and thermal conductivity, and high temperatures making them excellent substrates for mounting specimens. Packaged in a polystyrene disc storage box. These storage boxes have a magnet base to hold the magnetic stainless steel AFM discs and magnetic AFM sample holders. They are made of polystyrene with hinged lids. Perfect for storaging, archiving and transporting AFM discs. Retrieve your discs from their carrier with this magnetic pick-up tool. Made with a plastic handle, a stainless steel shaft and a magnetic pad at the tip. Your fingers never need to touch the disc. Use these unique grippers to easily pick up AFM/STM discs from a flat surface. Features a protective rubber-coated tip. Made from stainless steel with a serrated handle and a guide pin. The tip is bent at a 45 degree and formed into a ring, which has a diameter of 10mm when fully closed. 150mm long. 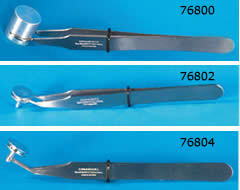 Dumont Specimen mount Tweezers, the finest tweezers available. Choose the one that best suits your needs. Unique Uni-Band Gripper - Made of 300 Series Memory Stainless Steel which is harder than titanium. Perfect gripper for handling specimen mount stubs. Precision machined from a block of aluminum – anodized black – this Sample Stub Vacuum Desiccators accommodates 18 SEM Mounted Sample Stubs, pin style, under vacuum for year long. Measures: 13 cm x 13cm x 4.5cm High. Chamber cavity is 10.4cm diameter x 18mm deep. Lid is made with 10mm thick clear acrylic.